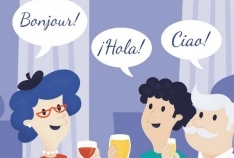 Would like to learn Spanish in Walton-on-Thames ? Fill in an enquiry (by clicking our "send an enquiry" button below) and we will let you know as soon as new classes are available in the area. Looking for a new licensee in the area	Join us ! We are looking for someone interested in being a Licensee in this area. If you are interested in teaching, please complete a form at https://languageforfun.org/teachers/looking-for-a-new-licensee/. email: enquiries@languageforfun.uk stating where you would like to learn and which language.